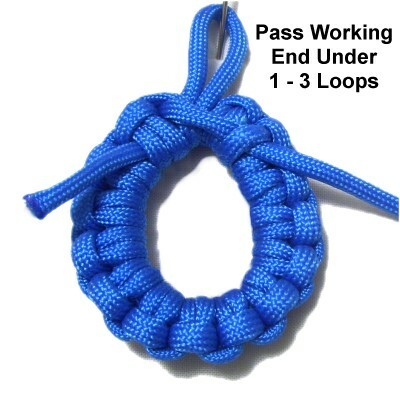 Description: The Barnacle Knot is a great way to make knotted loop designs for Macrame projects. This technique can be used for jewelry pendants and earrings. To use it as a holiday ornament, make it large and suspend bells or other decorations inside the loop. 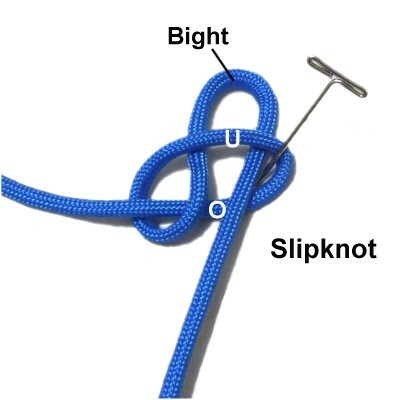 This decorative knot features a series of Larks Head knots, tied onto the bight of a Slipknot. 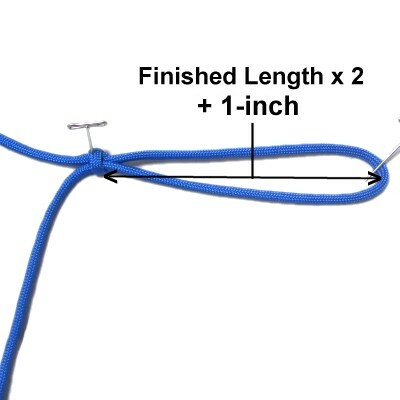 Nylon Paracord was used in the example shown. Please read Cord Preparation to find out how to prepare it properly, if you decide to use this material. The Ashoka Chakra is a similar technique. You tie a series of Slipknots rather than Larks Head knots. Click on the link or image to visit that page. 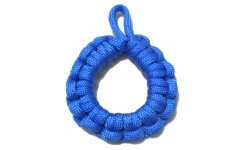 A video tutorial of this beautiful decorative knot can be found on the Fusion Knots website. Click on the image or link to see the website and videos. 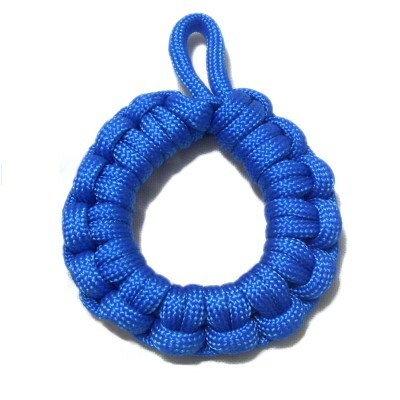 Preparation: To make this knot earring size (1-inch long), cut one piece of 2mm material, 36 inches long. For other sizes, you need at least 30 inches of material for every inch in size. Secure one end of the cord to your board (tail). Move over 2 inches, and make a counter-clockwise loop. The working end should pass under the secured end to make the crossing point. Step 2: Fold the working end to make a bight, and push it through the first loop over - under. This creates a Slipknot. Pull on the bight to tighten the loop around it. 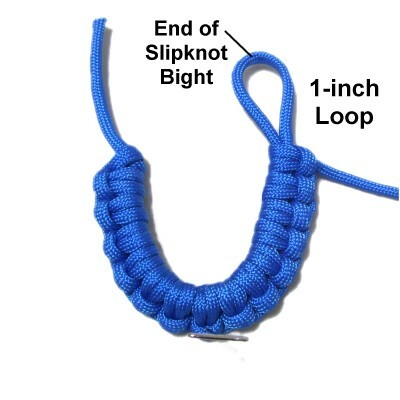 The length of the Slipknot determines the finished size of the Barnacle knot, so it needs to be adjusted to the size below. Designer's Tip: The finished length is the size you are aiming for, measuring from top to bottom. You need to add extra length so you have a loop at the top. When making earrings, you only need a small 1/2-inch loop at the top to attach the hook. All other items should have a 1-inch loop. Step 4: Secure the Slipknot with tension. 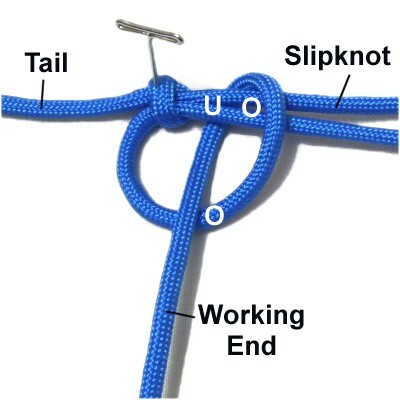 To make the first half of the Larks Head knot, bring the working end over - under the Slipknot. As you pull it down, pass over the portion of the working end directly below. Tighten FIRMLY. As you pull it down, pass under the working end. Tighten FIRMLY. 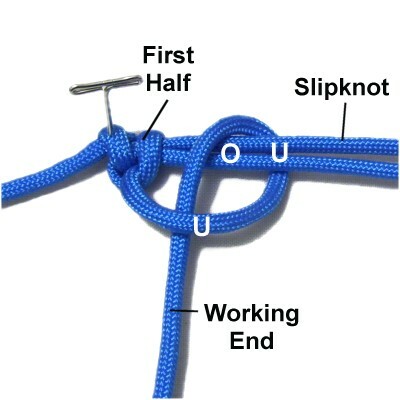 Steps 4 + 5 = one Larks Head Knot. Step 6: Repeat steps 4 and 5 several times, until the last knot is 1-inch from the end of the Slipknot bight (1/2-inch for earrings). Make sure the knots are close together, but do not overlap. Step 7: Turn the Barnacle knot upside down, so you are working in the BACK. 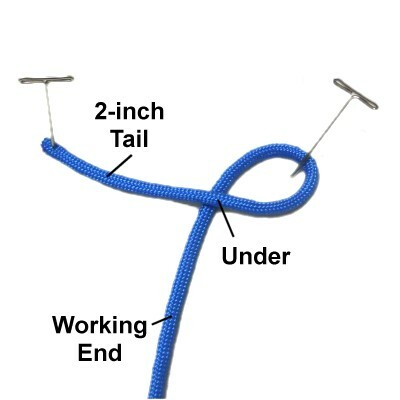 Pass the 2-inch tail through the loop. Loosen the last 2 Larks Head knots tied. 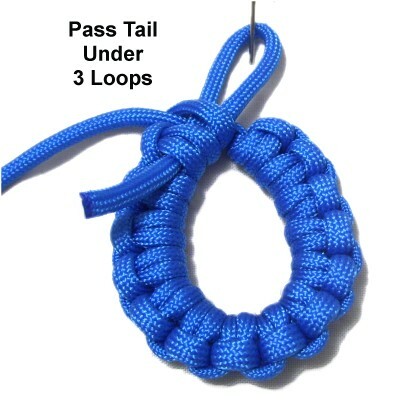 Step 8: Pass the tail under the loose Larks Head knots (total of 3 loops). Pull on the tail to form the oval shape. Apply glue, then re-tighten the knots. Step 9: Pass the working end under 1 - 3 loops in the back of the knot, and apply glue to secure it. Place it on the opposite side from where the tail was secured. 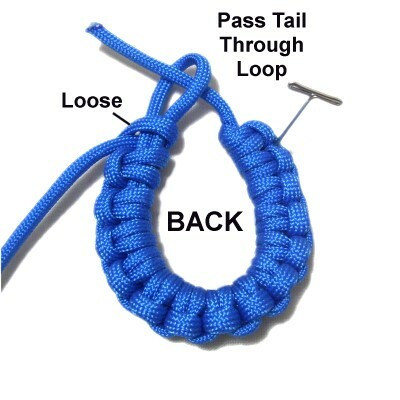 Straighten the loop at the top of the Barnacle knot. Make sure the last two knots are still tight. Wait several hours for the glue to dry completely. Then cut off the excess material. Have any comments about the Barnacle Knot? Contact Me.